The solution to obesity is not to eat less, but to eat more (of the right food). Here's how to eat a lot and still lose weight! If you live in the Western world, you’ve mostly likely been struggling with your weight at some point in your life. As of this year, 2 out of 3 Americans are overweight or obese and other countries seem to follow this trend. Even though doctors and the media have been trying to help us shed a few pounds, it’s somehow not working. Their mantra is that we should “eat less and move more”. If this caused sustainable weight loss, we would never struggle while being on restrictive diets and be already thin by now. But we need enough food to get through the day. So how can we eat a lot and still lose weight? Unfortunately, many diet plans focus on restrictions, such as “cut calories”, “don’t eat carbs” or “reduce your portions”. However, it has been shown that addition, specifically adding foods that are low in calorie density, is the best strategy for losing weight. Long term studies on low calorie dense diets have shown that those who made the greatest reductions in the calorie density of their diet lost the most weight. They also consumed the most volume and weight of food, which helped them to control hunger and keep them satisfied. Additionally, they also had the healthiest diets with the highest increases in fiber, vitamins, and minerals, and the greatest decreases in fat and saturated fat. So they ate more food, were more satisfied, lost more excess weight, and lowered their disease-risk without restricting or counting calories. It almost sounds too good to be true! The secret to understanding this is to understand the principles of calorie density. So let’s take a closer look. Calorie density is simply a measure of the concentration of calories in a food. The higher the calorie density, the higher the concentration of calories packed into the food bite for bite. This is an excellent indicator of how easy it is to overeat on a food, because the more calories that are packed into a food per bite, the more likely we are to overeat on that food. Foods that are low in calorie density, like fruits and vegetables, don’t pack a lot of calories per bite. They are stuffed not with calories, but with water and fiber, making them bulky (and therefore more filling), which allows us to lose weight without going hungry. On the other hand, foods that are high in calorie density, like cake or burgers, are stuffed with lots of calories per bite, with very little bulk (making them less filling), which can lead to an overconsumption of calories. All unprocessed or minimally processed fruits and vegetables, such as apples, bananas, berries, kale, zucchini, and bell peppers. You can eat freely of these foods. All unprocessed or minimally processed starchy vegetables like peas and corn, intact whole grains like brown rice and oats, and legumes like beans and lentils. You can eat a relatively large portion of these foods. More processed plant-based foods like bagels, dry cereal, bread, tortillas, and dried fruit. Limit the consumption of these foods. Nuts and seeds, oils and fats, chocolate, and junk foods. Greatly limit or avoid the consumption of these foods. The first 2 groups (low and moderate in calorie density) should make up the majority of your calorie intake. But the ratio of vegetables or fruits to starches can also be an important factor. We all know that eating a large bowl of lettuce might fill up your stomach, but it will keep you hungry at the same. So make sure to combine your low calorie dense foods with some starches from the second category in order to feel satiated and have enough energy to move around and follow your passions. You might have recognized that there are no animal-based foods in our 4 categories. This is because you need to remember that these should not be seen as food, since they are very harmful to your overall health and our planet. If you want to eat some chocolate or a burger, then choose the plant-based version and you will be just fine. Whenever you are hungry, eat until you are comfortably full of food lower in calorie density. Don’t starve or stuff yourself, and don’t eat when you’re not hungry. Start all meals with a salad, soup, or fruit. By starting with these foods that are lowest in calorie density, you begin to fill up on fewer calories. Liquid calories like soft drinks or fruit juice have little if any satiety, so they don’t fill you up as much as solid foods with the same amount of calories. Dilute the calorie density of your meals by filling at least half your plate by visual volume with a food lowest in calorie density, which are non-starchy vegetables and fruits. Non-starchy vegetables are the lowest in calorie density and fat or oil are the highest. Therefore, adding non-starchy vegetables to any dish will always lower the overall calorie density of a meal. Consequently, adding fat or oil to any dish will always raise the overall calorie density of a meal. If you use flour products or fats, integrate them into meals that are made of low calorie dense foods and think of them as condiments. For example, add a few walnuts or raisins to a bowl of oatmeal with fruit. This approach is meant to ensure you’re getting a solid amount of micronutrients like vitamins and minerals, which reduce cravings as well as the risk of getting most chronic diseases. While you should try to consume a lot of fruits, vegetables, legumes, and whole grains, make sure you also get enough calories, aiming for at least 1500 calories per day. Furthermore, we want to emphasize that calories are not evil. They fuel your body and are necessary for survival. Having to count them is an inconvenient task and the source where a calorie comes from matters greatly in the grand scheme of things. Some are completely devoid of nutrition and offer lots of harmful components, while others are bursting of micronutrients. In order to make things easier for you, we wanted to show you these 4 categories so you can stop counting and start filling yourself up! It would be a lie to tell you “just eat whatever you want and you’ll be thin” because this is not the case. If you want to lose weight and see good results, you have to make smart choices and not over-complicate things. We encourage you to fill up your plate with these low calorie dense foods and see if it makes any change. The key to a healthy and lean body is to fill your body as much as you want with beneficial and nutrient-rich foods – the rest will just fall into place. Get into Perfect Shape with Whole Plant Based Food. Actually, all of this was just one part of a whole concept. Putting all of what we know about easy and healthy weight loss on a plant-based diet into this one page just wouldn’t be possible! This is why we decided to write up a full guide that will explain what kind of strategy is absolutely perfect for effortless weight loss. You’ll basically get all the tools you need to not only lose weight but also improve your health and feel satisfied, satiated and energized at the same time. 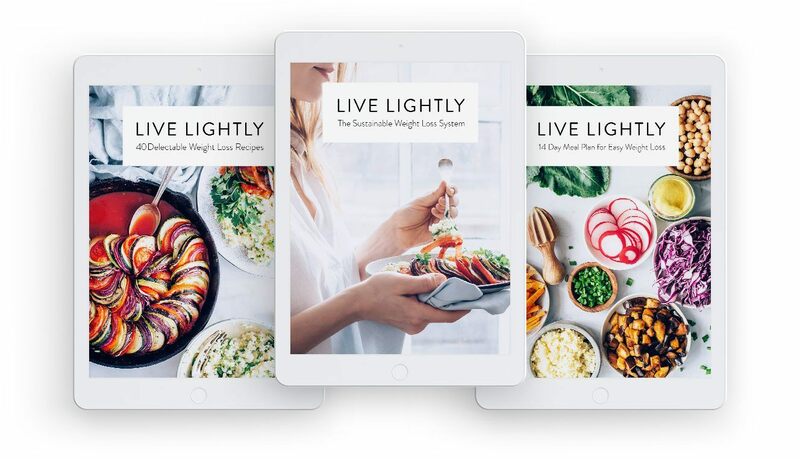 From educational passages, motivating studies and easy-to-follow steps to short summaries, worksheets, dozens of satisfying weight loss recipes, and a fully laid-out 14-day meal plan: Everything will work in perfect synergy to set you up for success.